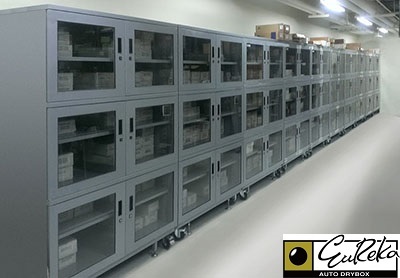 Eureka Auto Dry Box / Dry Cabinet product series are manufactured by Taiwan Dry Tech Corp., the industry innovator in relative humidity (RH) / moisture control Auto Dry Box, Dry Cabinets and Electric Desiccators. We are a B2B brand in the global market with product distribution thru our agents and dealers. Eureka Dry Tech is committed to developing dehumidification technology that is comprehensive, fully automated, cost saving, and durable. Helping people all over the world solve once and for all problems with humidity and moisture damage in areas such as manufacturing, collection and daily life. Eureka Dry Tech offers low humidity (25%~55% RH) Auto Dry Box, Dry Cabinet, and Electric Desiccator for moisture controlled storage of everyday life items. We also offer Ultra-Low Humidity (1%~20% RH) Fast Super Dryer industrial grade dry cabinets for the surface mount technology / EMS industry and Research Laboratory use. Eureka Dry Tech's Fast Super Dryer meets the storage and handling standards of IPC/JEDEC J-Std-033 and IPC-1601 as required in high-tech manufacturing industry for trace moisture removal. Providing optimal storage environment for moisture sensitive items such as wafers & dies, IC packages, PCB, and SMT (surface mount technology). Eureka Dry Tech's moisture adsorption technology can also be utilized as separation, purification, and environmental control. Eureka Dry Tech possess a strong supply chain from upstream to downstream. We provide fully customized dehumidifying cabinet products with competitive pricing while maintaining first-class quality to suit our customer's needs. No matter what you are storing, collecting or displaying, all items will benefit from moisture/humidity damage protection by storing in our products. We are a manufacturer with capabilities in providing fully customized auto dry cabinet, auto dry box, desiccator, and dehumidifier cabinets products in various sizes, designs, colors, and materials such as wood/steel/stainless steel. Eureka Dry Tech has millions of Auto Dry Box & Fast Super Dryer global users' approval of its fully automated and friendly dehumidifying dry cabinet designs, free of any complicated installation and constant maintenance. Eureka Dry Tech will provide you with industry leading solution to serve you in all aspects. Consult us with your humidity/moisture control needs and we will provide you with the best solution on the market. Without a doubt Eureka Dry Tech is the top choice in humidity control solution.